Wild Heart came about a month ago and I’ve mentioned her in the blog but not been very focused on her here. Green to 100 is the story of Khaleesi and me on a journey to a one-day 100, but Heart fits in the story as a team member and the things I have learned through Khaleesi’s process will now have a chance to be tested on a new horse as well as hopefully learn new things. As a bonus, team green member Susan will be doing a lot of the work with Heart and that means sometimes I get to watch, video, and direct from the fence and I’ve already found that can be extremely valuable for me (seeing it from a new perspective) than being the only one involved. So I decided to create a little space in green to 100 for Heart’s story as it unfolds and intertwines with Khaleesi’s. When I blog about Heart I’ll list it as a Heart: blog. Wild Heart is a 5yr old Wyoming mustang mare who was rounded up around 2 and hung out in a holding pen until she was chosen to make the tour for some Extreme Mustang Makeover events this past Spring. She was assigned to Jennifer (a trainer currently in TN you can find info on her at Jennifer brown horsemanship ) in Illinois and early in the process the mare got hurt and had to be pulled from competing. 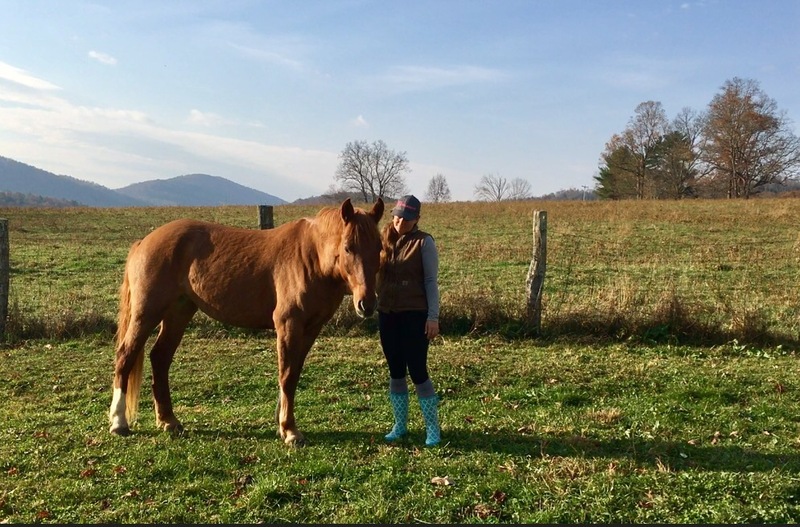 Jennifer thought the mare had potential so instead of sending her back injured, she took her home to TN, healed her up and put some basic training on her enrolling her in the Mustang Heritage Foundation Trainer Incentive Program (TIP)– where I found her. 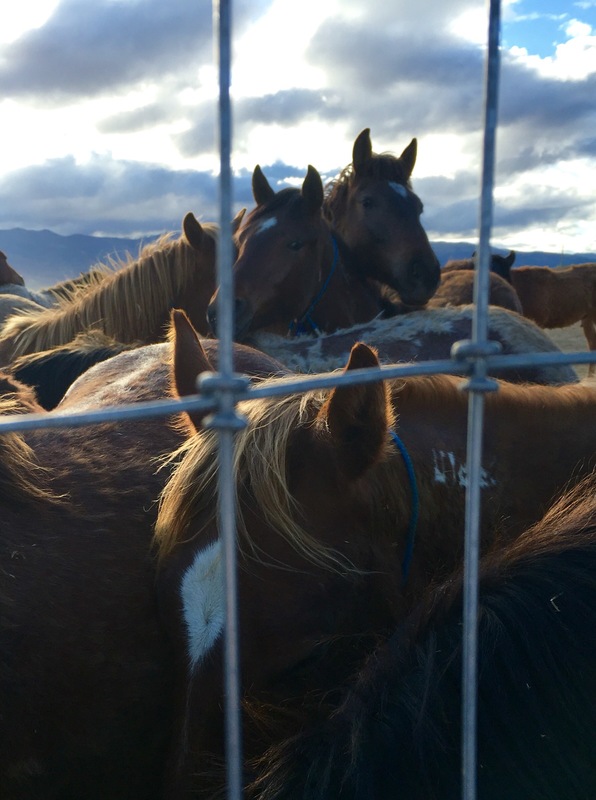 I’d been interested for a long time in the American wild horses, I wanted a horse as little ruined by humans as possible (genetically and behaviorally), and also to help the plight of these unwanted animals and this management nightmare the BLM (Bureau of Land Management) is trying their best to sort through. Adopting a truly wild horse is a commitment bigger than I have time for in my life right now, and I don’t have access to the secure (think maximum security!) facilities to keep one locked down until gentled enough to accept normal horse confinement. The Trainer Incentive Program gives these wild animals a good start with someone more equipped to get them to a point someone like me can work with. My only fear was having to rebuild confidence or trust if the initial trainer was overly harsh or used pain avoidance training in those first weeks. Heart had a great start with Jennifer. She is curious, smart, and very communicative. When I saw Jennifer load her on my trailer before dawn in TN so we could get her to VA I knew she’d been on good hands. 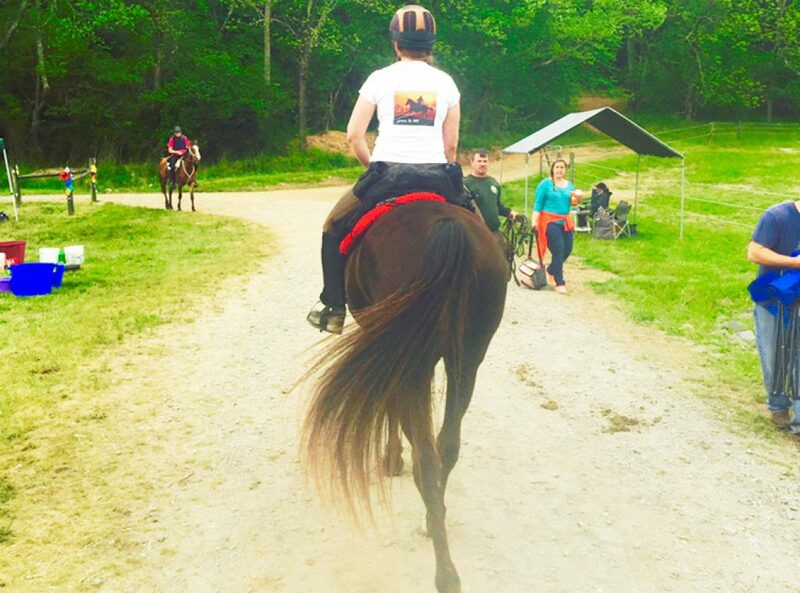 I have seen many trained and well ridden horses struggle with the trailer – my first few attempts with Khaleesi took much time and patience and we didn’t even always get all 4 feet on… and considering what trailers have meant for this horse in her life I can’t imagine she would think very highly of them. However Jennifer loaded this mustang in about 15 minutes one hoof at a time. Every step she would encourage her: You’re doing great girl, go ahead, check it out, take your time, you can do it. And the horse would take another step. She trusted Jennifer gently one step at a time all the way into that little box (the smallest trailer she’d ever been in) and Jennifer stayed with her, just calm and gentle until her had all the doors closed. Not a fight, not forced, never pushed her or pulled her- just encouraged. I knew at that moment we had a chance. A horse people haven’t ignored, forced and ‘trained’ into being shut down and not interested in giving humans a real chance. And as Susan reminded me… she is also a very pretty girl! That’s a bonus. Heart is a joint project with Susan and will be the horse Susan rides the most in the seasons to come. She will make a good training buddy for Khaleesi as Faygo is just not able to do that with her age and health what it is. Team green needed another training and conditioning buddy to ride with as we attempt to get higher mileage toward the 100 goal, and Susan needs a horse to really start competing some limited distance rides. That is where her interest is and should be great for Heart. 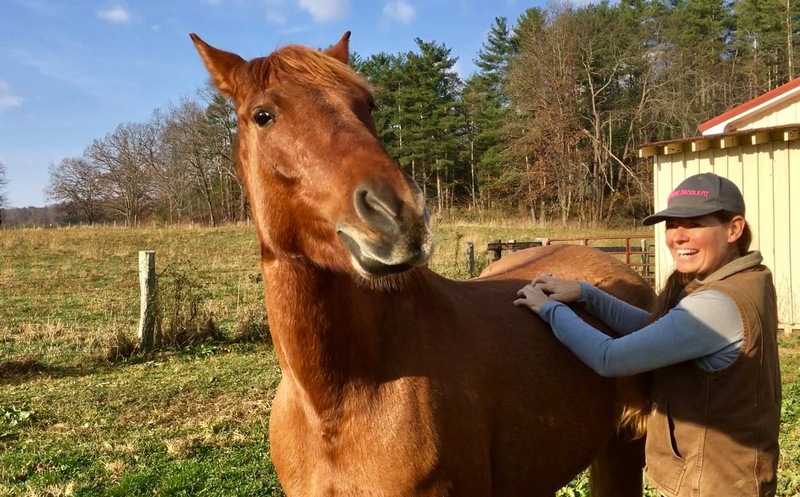 Built like a tank, we have no idea what her heart rate as recovery will be and how she’ll move along on trail, but Jennifer said this horse loves getting into the woods and is a nice mover. I believe that just about any horse can get through a 25-30 mile race sound and metabolically healthy. If you aren’t worried about finding that ‘top 10’ horse then it’s all in the conditioning and training and building the horse slowly towards the mileage. She should be sturdy and sound, she has great feet, trunk like solid legs and a big muscular hind end. 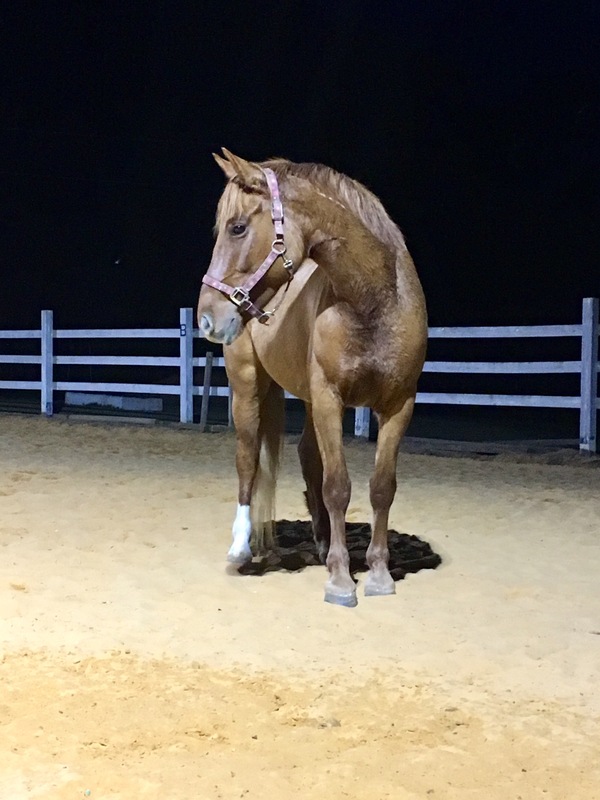 Jennifer is a dressage trainer among the rest of her specialties and Heart is already moving nicely and has muscled up well from what she started. Our job is to continue the good work. Susan has a nice base of riding training to draw from to stay balanced and to ride her in a way to continue that development. I have been very pleased to watch how light, balanced and responsive both Faygo and Levi have been under Susan’s riding. I have become a believer this year that how you ride shapes the horse’s body and muscling more than almost any other factor and am grateful for the small amount of help in that I’ve had with my own riding. I am constantly vigilant to improve myself as well. Wild Heart is still alone in her paddock with hay, water, shelter and the ability to see the 10 or so other horses on the property. We have done some groundwork and she carries her saddle too. She is basically good to be tied and we’ve had her in the barn with my other mares a few times. She’s reared twice and pulled back on her line for various ‘spooks’. We use a tie method that gives her a little rope so she’s not ‘hard’ tied but she cannot break free. She has pulled up, come down and stood calm. Perfect: testing the system and realizing she’s ok, and she can’t get free by pulling. I can clean all 4 feet and her fronts she offers pretty easily. She doesn’t always give to pressure so that is an area to work. In fact she gives on lead pretty easy, but not when tied (step over so I can work on this side without being smashed between you and the barn wall). She is responsive, very quick to learn, willing, and carries lessons over from one day to the next. Her fault is wanting to be in your space too much and I’ve been working at getting her comfortable standing a few feet away quietly if I ask. She loves attention and being rubbed so creating boundaries and leadership is key with her (she can push in an inch at a sweet time if you aren’t careful- it seems loving but it’s also rude in horse language). Susan and I are both on the lookout for the subtle ways she will move your feet when you aren’t aware enough. ​Now that we’ve begun a relationship with her and she’s settling in she will move in with Khaleesi and Faygo next week (after Khaleesi’s metal shoes get pulled- less opportunity for damage if they do quarrel). The process is flexible and shaping up as we go. Soon I hope to be ponying her on the trails while she gets comfortable with Susan and I as a rider in the enclosed arena. Lots and lots of groundwork will continue because I have seen the incredible positive effects it has on the horse-rider relationship. I believe she is going to make a nice horse! Previous: Previous post: Training on the trail. Love the scratching picture. My husband’s Mustang completed his first 50 this fall. He’s not the fastest, but he’s very surefooted. I really like the mentality of the Mustangs. I’m sure yours will do well. Glad to hear it- everyone I know with mustangs loves them! Some seem to do best at LD and some seem to do fine in 50s too. We’ll see with Heart but Susan is most interested in LDs at the moment so we should be fine either way! What a story! She sounds very lovely and I hope everything turns out for both of you. Good luck on your journey!